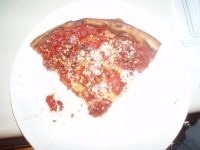 I decided to revisit Nancy's Pizzeria, a Chicagoland pizzeria favorite, after going many years without eating its famous stuffed pizza. The main difference between stuffed pizza and deep dish pizza is the layer of cheese is much thicker in the stuffed pizza than the deep dish pizza. And boy, can you ever taste that cheese difference with Nancy's pizza. Unfortunately, part of the reason why you notice the cheese so profoundly is because of its icky texture. I despise how difficult it is to chew Nancy's cheese--I felt myself choking at least 3 times. The rest of the pizza was decent; the pizza sauce and crust were in good symmetry and the sausage topping was fresh but unremarkable. But you want to know the worst part about ordering stuffed pizza from Nancy's? The price: it cost me $20 for a small stuffed pizza that fed 2 people! Actually, let me give credit when it is due. After hearing how horrified I was to learn the price when ordering the stuffed pizza on the phone, I was offered a buy-1-pizza-get-1 free deal. The problem was the pizza wasn't good enough to eat a 2nd time. The menu proclaims that Nancy's pizza has been named "The Best Stuffed Pizza in Chicago" by ABC-TV. I don't how long ago that assertion was made because I've certainly tasted better stuffed pizza lately. As always, when I have a less-than-satisfactory pizza-eating experience, I ask the readers: do you agree with my review, or have you had a much-better pizza eating experience than the one I described? Sound off below. Nancy's Pizza in Chicago gets 4 out of 8 slices.